Russia fishermen catch about four million tons of fish annually and almost half of it is exported. China, South Korea and Japan are the main clients. RBTH spoke to Vasily Sokolov, Deputy Director of the Russian Federal Fishing Agency about the potential about of the potential of the country’s fishing industry. According to the Russian State Statistics Service, in the last three years Russian fishermen have caught around 4.3 million tons of fish annually. A stable growth in the industry has been observed since 2009. The annual increase in the haul of seafood is around 10 percent per year, according to Vasily Sokolov, Deputy Director of the Federal Fishing Agency. “From the volumes of fish caught, we obtain 3.6-3.7 million tons of edible products,” Sokolov says. “A part of this is exported, but we also import fish. Exports constitute about 1.6 to 1.8 tons, that is, almost half.” Last year both exports and imports equally declined by 10 percent. Russian fishing vessels do just not navigate Russian waters. They are found in the North Atlantic, as well as around Africa. Primarily frozen fish is sold in Russia, but there is a growing market for processed fish. Traditionally, Russia has exported frozen pollock, which constitutes 43 percent of the fishermen's haul, around 1.5 million annual tons. Sokolov says that there is no demand for this fish in the domestic market, and it is mainly exported to China and South Korea. Pacific Herring is also popular abroad and about 250,000 tons are exported annually from Russia. At the same time, Russia imports about 100,000 tons of herring from Norway and Iceland every year. This is largely because Russia's main haul of herring comes from the Far East. Sokolov says it makes more business sense to sell the produce from the Russian Far East to Asian countries, while European Russia’s demand is satisfied with imports from Scandinavia. Another fish that is exported at substantial volumes (around 145,000 tons annually) is the Atlantic Cod. Trading on the global market expands one's opportunities. 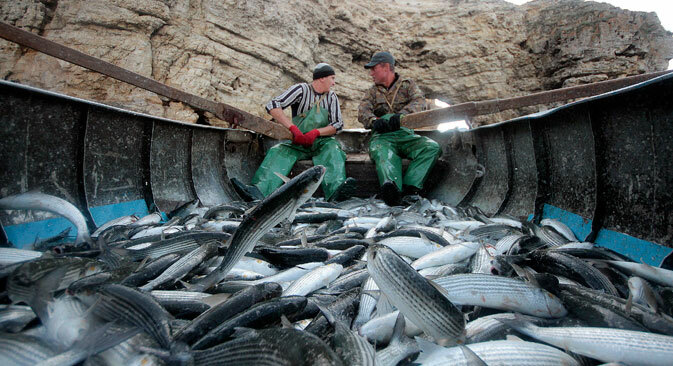 Russian fishermen have started supplying herring to Africa. “This is a good source of protein, but we have competitors, such as chicken meat exporters from Indonesia and the US,” Sokolov says. The Federal Fishing Agency is also actively pondering over the supply of pollock to Brazil. Over the last year, Russian enterprises have started replacing Atlantic Herring with the Pacific version. They have also started farming shrimp, but there are logistical problems related to selling farmed products. Fishermen do not see a sufficient demand in the domestic market and are looking for buyers abroad. According to Skokin, in some cases, in order to avoid paying taxes, fishermen can sell their hauls directly at sea without first bringing them to the ports and declaring their earnings. “If we use pollock as an example, Russians do not really like it, not only because of gastronomic reasons, but because it is resold several times and when it finally arrives in the European part of Russia its price has increased by two or two and a half times, which does not make buying it worthwhile,” explains Skokin. World Fisherman's Day is celebrated every year on June 27. How does salmon from Norway find its way into Russia?